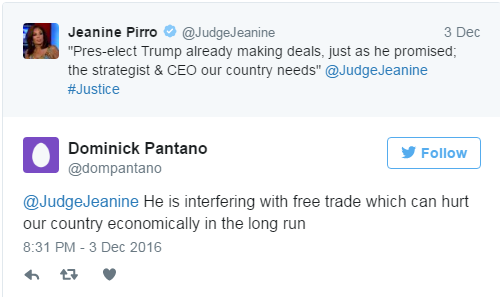 I caught Judge Jeanine’s opening statement Saturday. I’ve always enjoyed her strong personality. 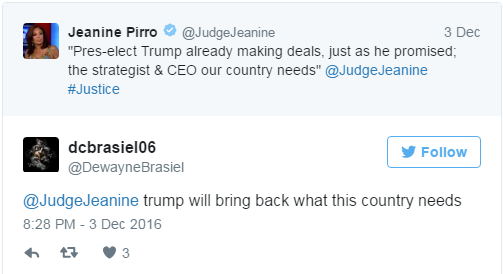 And I appreciate her loyalty to Donald Trump, but I think comparing him to Ronald Reagan is going just a bit far. In fact, Trump hasn’t proven himself yet. He may very well be a great president and so far, I like some of the things he has done and the people he has chosen. But certainly, not all of them. Reagan won in a monstrous landslide when he was elected, Donald Trump did not. It remains to be seen if his policies will hold the same bite that Reagan’s did. But he is just starting and hasn’t even taken up residence in the White House yet. Comparing Trump to Reagan makes me cringe. 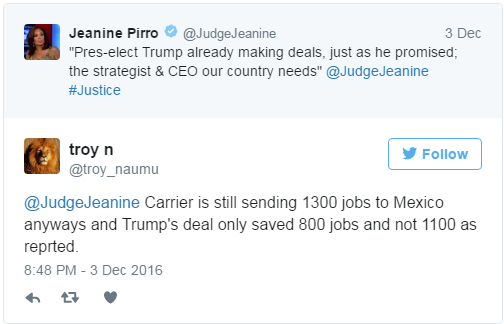 I am thrilled that Trump has gotten Carrier to keep some jobs here in the US. I feel happy for those that will keep them and that their lives will not be turned upside down. But as I have said before, I have an issue with the way it was done. It feels like extortion. Keep the jobs here or lose billions in government contracts. Reagan brought business and jobs back by massively reducing taxes and regulations. 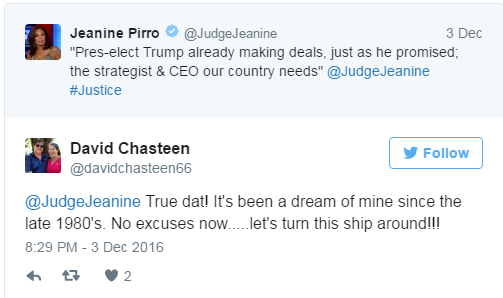 That is what President-elect Trump needs to do as well. Starting a currency war by imposing a 35% tariff tax on those who take their business out of the country is a recipe for another Depression. 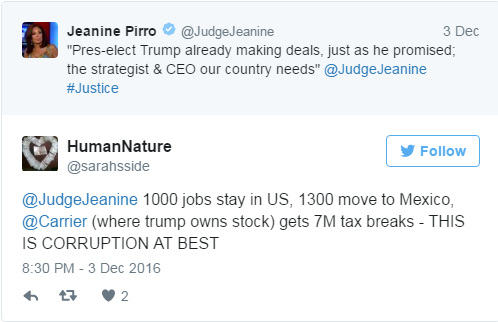 Trump needs to make it so attractive for business to be here that they come back… not strong-arm them into coming back. By the way… that 35% tax will be passed onto each of us. Unintended consequences are a b*tch. I don’t want to dump on Trump… he hasn’t had a chance to really do anything yet. I was alarmed that Ivanka Trump met with Al Gore this morning. The media is calling her a Climate Czar. I really hope that is not true. Ben Carson as HUD Secretary is also confusing to me as Carson has said he has no idea how to run the government and now this. I do love the Mattis pick and I am praying Trump chooses John Bolton as his Secretary of State. It will stand our enemies on their heads and leave them trembling and wetting themselves in a corner. Sheriff Clarke would be excellent heading up DHS as well. 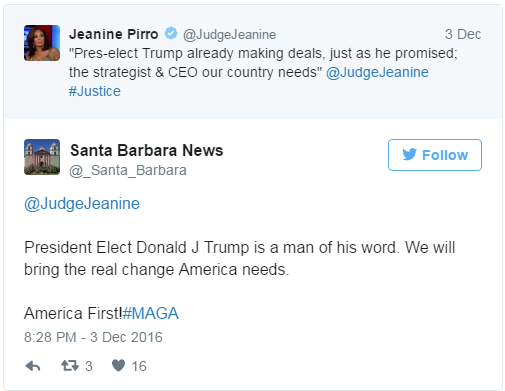 Pirro is a long time friend of Donald Trump. Her husband has done business dealings with him over the years. Her loyalty to Trump is rock solid. I get that in politics there is a certain level of rah rah. But whereas I don’t want to condemn Trump before he really gets started, I also will not compare him to a legendary president such as Ronald Reagan.